Preparing wild animals for cooking and eating is often considered a novelty, back-to-basics survival skill. Those who enjoy their dinner hearty, fresh and filling, however, can benefit from learning how to gut and skin a rabbit. Once armed with the necessary information and a little courage, you can prepare your own rabbit and enjoy it from the comfort and warmth of your own home. In time, rabbit might well become a regular feature of your dinner table. Firstly, it is important that any urine is expelled from the rabbit before gutting, so as not to contaminate the meat. 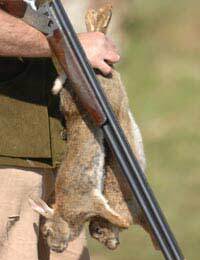 As soon as the rabbit is killed, whilst still in the field, hold it by the chest in one hand with its stomach pointing upwards and its rear legs pointing downwards. Using your other hand, gently stroke the belly downwards to remove the urine. To gut the animal, take a sharp knife and, holding the rabbit around the chest in your left hand, insert the knife just below the ribs, making a cut roughly two centimetres in length. Insert two fingers into the incision and tear the cut until it is around six centimetres long. Then, holding the back feet of the rabbit with one hand and the chest with the other, swing it quickly and at shoulder height to remove the entrails. The end of the entrails attached to the animal’s rear can be torn safely. The other end of the entrails will be attached to the stomach, deep within the animal’s body. Grip the stomach with one hand and remove it swiftly, being careful not to puncture it. Remove the rabbit’s heart and lungs right before cooking, to ensure the meat remains fresh. A membrane, the diaphragm, can be punctured, enabling the simple removal of the heart and lungs. A messy process, be sure to skin your rabbit outside. Lay the rabbit on its back, upon a clean piece of plastic sheeting. Using a sharp knife, begin to separate the skin from the meat, working around from one side to the other. Grasp the rabbit and peel off the rest of the skin. The tail, legs and head can then be removed with a strong pair of kitchen scissors. Be sure to then wash your rabbit, so as to remove any blood or fur that might remain. Next, dry the meat using kitchen roll. Prior to cooking, take care to remove the two loose flaps of skin found on the sides of the rabbit. Any remaining entrails or unappetising parts can also be removed at this point. Rabbit can be enjoyed in many ways. A rabbit stew is a popular and comforting dish that requires minimum effort when it comes to cooking. Brown rabbit joints in a pan and transfer them to a casserole dish, adding softly fried onion, carrots, celery, bay leaves and thyme. Pour over a 500ml bottle of your favourite cider and add a dash of water. Season well and add a dollop of honey. Simmer and cook on a very low heat for just under two hours. Serve over crushed potatoes with leeks fresh from the garden. If you’re keen to try something new, try creating a rabbit soup, a rabbit stir fry or roast the animal whole with olive oil, honey and sea salt. Whilst it takes a fair amount of effort to gut, skin and prepare a rabbit for cooking, you are sure to learn a great deal in the process. For some, knowing exactly where their dinner has come from and being part of its journey from the field to the plate is a rewarding rural experience.